The Secondary Suites project was based on a four-phase process. 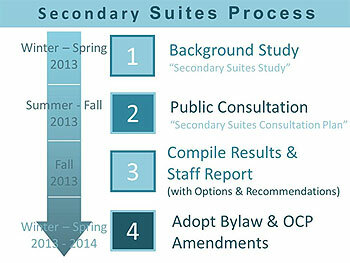 Phase one involved the creation of a secondary suite study and consultation plan. The Study provided background information on secondary suites including a summary of the benefits and challenges of allowing secondary suites in a range of locations; a review of different issues that need to be considered prior to allowing suites and; a discussion of factors that should be considered for determining where secondary suites could be allowed in the region. The Study was based on a staff review of existing data on housing in the region together with the experience and practices of other jurisdictions that allow secondary suites. The information presented in the Secondary Suites Study was used as background information for implementing Phase 2 of the process outlined in the Secondary Suites Consultation Plan. This engagement phase provided an opportunity for the community to share their thoughts on Secondary Suites in the RDN. During Phase 3 of the process RDN compiled and analyzed the consultation results. Based on the positive community response to secondary suites, a draft proposal was developed and opportunities for public input on the draft secondary suites proposal were provided. Based on positive community response to the draft secondary suites proposal, zoning amendments were initiated. There were further opportunities for the community to provide input prior to the adoption of the zoning amendment bylaws on May 27, 2014. The following provides an overview of the community engagement activities held during the secondary suites project. A Public Hearing was been scheduled for proposed Zoning Amendment Bylaws 500.389 and 1285.19 on April 7, 2014 at 7:00 pm in the RDN Board Room located at 6300 Hammond Bay Road in Nanaimo. Home owners, renters, and those who plan on becoming home owners or renters in the near future were invited to participate in an online survey. The purpose of the survey was to gather community input on secondary suites that would be used to inform a staff recommendation to the Board on how to proceed with secondary suites within Electoral Areas A, C, E, F, G, and H.
Thanks to all who participated in the online survey. The survey is now closed. Please click here to view the results. The RDN hosted four information sessions to raise awareness about the RDN Secondary Suites Project and to provide opportunities across the region for Electoral Area A, C, E, F, G, and H residents to discuss secondary suites with RDN staff and share ideas and concerns. Regional District of Nanaimo Staff attended community events throughout the region during the 2013 summer months. Regional District of Nanaimo staff were in attendance at the following events to provide information and answer questions regarding secondary suites. The RDN has prepared informational materials including a presentation and a brochure. Click the link below to download the Powerpoint Presentation to present on your own. The following reports have been presented to the Board as part of its consideration of the proposed secondary suites program. Revised Bylaw 500.389 Report March 25, 2014 To consider amendments to proposed bylaw 500.389 and consider adopting the proposed secondary suites policy. Proposed Bylaw 500.389 was given 2nd reading as amended. The proposed secondary suites policy was adopted. Revised Bylaw 1285.19 Report January 28, 2014 To proposed amendments to bylaw 1285.19 prior to 1st and 2nd reading The staff report and recommended changes to Bylaw 1285.19 were considered. Discussion at the Board meeting resulted in alternate amendments being made prior to 1st and 2nd reading. The bylaw was then given 1st and 2nd reading as amended by the Board. Note the bylaw attached to the staff report has been further amended by the Board. Bylaw amendment 500.389 was given first and second reading and staff were directed to proceed. The proposed secondary suite policy was referred back to staff for further discussions with the Electoral Area Directors.